Comments:"This trip in Nepal with Adventure Treks Nepal, and staff are by far the best I've ever come across!" Comments: This was truly a unique experience and one which we will never forget. 03. Blin Veronique Ms & Fouque Marc-Olivier Mr. 02 Pax. Comments: " It was an Excellent trip ! " Johanson Dorthe Ms, Fonder Schmidt Jenson Dorthe Ms & Kent Jensen Mr. 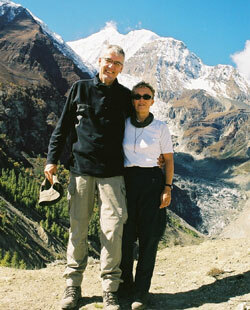 In September 2004 we had a great trip to Nepal. Before leaving Denmark we did a lot of research and planning. Normally we do everything by ourselves concerning hotel bookings, transportation etc – but this time did we choose a local tour operator to set up our trip. 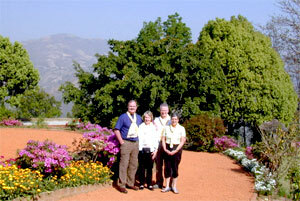 Among the many tour operators we choose Adventure Treks Nepal (P). Ltd. - as it made a good impression on their web-site and had quick responses on our questions (e-mails). We just provided our wishes on what to see and where and when to go – then it was all planned by the owner of Adventure Treks Nepal (P). Ltd., Mr. Gyan karki. The planning fase went very smoothly and that made our expectations to the trip itself even higher. And let me be clear about this; our expectations were met fully by Mr. Gyan karki – as he and his employees during our one month visit took very good care of us ! 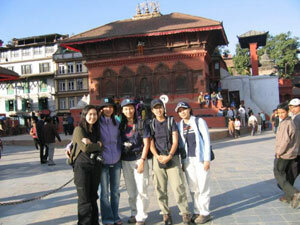 Our itenerary included 4 days of sightseeing in Kathmandu, 3 days sightseeing in Pokhara, 3 days safari in Chitwan Natl. Park, 20 days trekking around Mt. Everest and finally a couple of days relaxing in a good hotel in Kathmandu. All hotels, transports, trekking including flights, porter, guide, accomodation etc was arranged by Adventure Treks Nepal (P). Ltd. and as stated above it went very smooth – also did we benefit from some of the good deals Mr. Karki has with the different hotels etc making it difficult to do it cheaper on our own. Our start was in Kathmandu were we experienced all the normal tourist attractions (temples etc) and the busy town life of the capitol of Nepal. We stayed in the tourist area of Thamel in Hotel Vaishali, conviently located for going out in the cozy area around for dinner or a beer at a bar. Pokhara (Hotel Barahi) – introduced us to the first views of the snowcapped himalayas. The beautiful lakeside town had a very cozy feeling and there was a great atmosphere in the tourist area at the lake. We enjoyed some mountain biking which gave a good impression of the countryside. Then we had 3 exciting days in Chitwan Natl. Park (Chitwen Jungle Lodge) spending most of our time on the back of an elephant – we saw rhinos, a lot of different deers, wild boar, etc - sorry no Tiger but footprints from some. Tiger is seen very seldom. We were also introduced to a small local village nearby. – Great experience ! After the safari we were picked up by Mr. Karki himself and a driver then went back by the bumping roads to Kathmandu and further on to our trek around the area of Mt. Everest. Our trek started with the flight to the mountain town of Lukla – impressive landing on a mountainside !! During our trek we visited the lakes of Gokyo, Gokyo ridge, passing over the Chola pass visiting Kala Pattar and enjoying beautiful vistas of Mt. Everest and all the other beautiful mountains. We enjoyed the trip a lot and stayed at nice lodges – with exception of the accomodation at the Chola pass which is very basic (but there are no other options). Back in Kathmandu we ended our trip by relaxing in the luxurious Hotel (Hyatt Regency) - we also experienced a local dance show where we were introduced to the family of Mr. Karki - very friendly family !. All in all a trip of a lifetime perfectly organized by Mr. Karki – and making us think about planning another trip – maybe next time to the mountains around Pokhara. We were not affected on our trip by the political situation in Nepal – but we hope the peace will settle in Nepal as this beautiful country has so much to offer. Thanks to staff of Adventure Treks Nepal (P). Ltd. , Mr. Gyan karki and his family. für die Planung und Durchführung unserer 24 tägigen Trekking Tour vom 28. September bis zum 21. Oktober 2004 um das Annapurna Massiv durch Ihre Agentur, bedanken wir uns sehr herzlich. Comments: " We had a wonderful time! we can't even begin to describe it. 08. Lars Munk Ditlersen Mr & Per Godsk Mortensen Mr. 02 Pax. Comments: "This was a lifetime dream for us and all Our expectations were met and more ! " 09. Bui Bich Hien Ms & Webb Peter Mr. 02 Pax. Comments: This Trip was amazing! We could never have imagined how great the trip would be. It was way beyond my expectations! Everything was super well organized and every detail was taken into account. Congratulations on a job well done!" 10. Angkarattanapichai Puntip Ms, Apinya Suthichayapipat Ms, Unchana Changthatya Ms,Primporn Issarathumnoon Ms, Trisara Kittisophon Ms & Saowanid Jitjairak Ms. 06 Pax. Comments: "This is a lifelong memories"
It is not very easy to Choose a Trekking Company because there are more then one thousand trekking companies in Nepal. We have some feed back from our past clients. If you like to contact them we are happy to forward their details"